I don’t blog because I’m a writer. 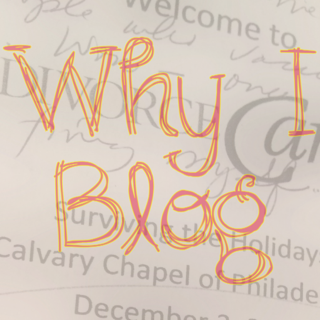 I blog because I’m a communicator. This doesn’t mean I’m a talker, although I do talk, just not excessively. In all honesty, I do talk excessively – in my head. That’s why I blog. You know that person who lives in your neighborhood that walks around talking to themselves? I know you have one, every neighborhood has one. My overactive mind thinks in blog posts and Facebook statuses and needs an outlet. In reality, I’m just a hair’s breadth away from becoming my neighborhood’s next Talker Walker. The above picture is of an upcoming blog post scribbled on an article from DivorceCare about Surviving the Holidays. I wrote it on the only piece of paper I could find while vacuuming. I generally have a scrap of paper in my pocket at all times in case of brain overflow. I wanted to let you know that I think you really are a great writer and I enjoy your sense of humor. Jill B.’s writing and humor is also very good. Maybe you two can get a business venture going such as a mom’s inspirational/comedy team. With ten children between the two of you, I know you can be provided with a lot of material! Thank you! And Jill and I would LOVE that. Not just bc she is my BFF, but bc she is an actual published author! Actually that is why I mentioned Jill. I heard her speak at one of our women retreats and she was wonderful! I believe she gave out a handout of an article she wrote. I then googled her name and found other things she had written. God has given you and Jill a great talent and it is something to pray about.